Biomedical researchers at The University of Toledo are working with substantially greater support thanks to a significant investment in new laboratory equipment from ProMedica through the Academic Affiliation with the College of Medicine and Life Sciences. University and ProMedica leaders joined faculty and staff Oct. 11 for tours of renovated laboratories on Health Science Campus and to celebrate the investment. The new state-of-the-art equipment encompasses 11 instruments across three labs in the Health Education and the Block Health Sciences buildings. 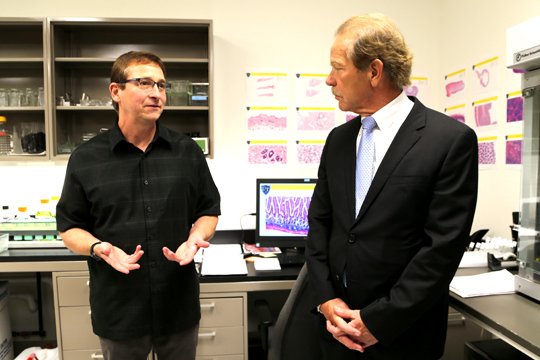 Allen Schroering, histology lab manager in the Advanced Microscopy and Imaging Center in the College of Medicine and Life Sciences, discussed lab improvements with ProMedica President and CEO Randy Oostra. Signed in 2015, two major goals of the Academic Affiliation are to recruit and retain top talent to the region and to grow biomedical research. The University additionally seeks to increase external research funding to support ongoing discovery. Leaders of both institutions believe that first-class research capabilities will support both goals. Dr. William Maltese, professor and McMaster Endowed Chair of Biochemistry and Cancer Biology, expressed appreciation on behalf of University researchers for the investment, and assured University and ProMedica leaders that the new equipment was selected after careful consideration of the resources needed to support and grow biomedical research at UT. Many of the new instruments replace antiquated equipment with updated techniques and newer technology, and high-throughput systems improve speed and efficiency by producing results and analysis in just days for tests that previously took months. The investment additionally includes instruments new to the University, providing technology and capabilities previously unavailable in the research enterprise. This entry was posted on Thursday, October 19th, 2017 at 3:00 am and is filed under Medicine and Life Sciences, News, UToday .